Hugo Chavez's little Kiwi collaborators, Socialist Worker, are touring a top Venezuelan revolutionary around New Zealand this coming week. 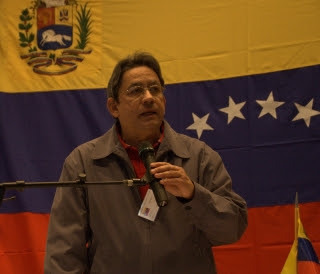 Revolutionary Venezuelan diplomat, NELSON DAVILA to speak. Nelson, who is based in Canberra, is Venezuela's charge d'affaires for Australia, NZ and the Pacific. He is not your traditional diplomat, starting out as a student activist, then becoming an indigenous rights activist, and joining Huge Chavez's secret revolutionary group inside the Venezuelan armed forces. He is one of President Chavez's closest and most trusted political collaborators right up to this day. Nelson will speak about the nature of the Venezuelan revolutionary process, including the recent formation of the five million strong United Socialist Party of Venezuela, the government's strong support for indigenous rights in Venezuela, and the growth of Communal Councils which have delegated powers to decide on local and regional priorities along with a huge chunk of state funding to implement their own plans at the grassroots. Nelson is hoping that his tour will give impetus to the establishment of a broad-based, inclusive Venezuela solidarity movement in New Zealand. It is hoped Nelson’s tour (one week in NZ) will result in the creation of a nationwide Venezuela solidarity network pave the way for a visit to New Zealand by President Chavez. A member of the Left's favorite warmongering neo-Communist state in Latin America is in New Zealand. Will these "peace activists" protest Chavez's warmongering rhetoric toward Colombia over the death of Raul Reyes, member of FARC? I wouldn't be holding my breath MAH. Aggression is OK with the "peace movement" when it comes from the left. It just seems like it's the twilight zone, here doesn't it? Are you serious when you imply Colombia is 'one of the few remaining free countries in Latin America'? Colombia has a terrible human rights record. Paramilitaries and death squads connected to the armed forces regularly 'disappear' journalists, peasant leaders, unionists, community leaders and others who speak their mind. Usually those who are disappeared have nothing to do with the FARC. "Are you serious when you imply Colombia is 'one of the few remaining free countries in Latin America'? Colombia has a terrible human rights record. Paramilitaries and death squads connected to the armed forces regularly 'disappear' journalists, peasant leaders, unionists, community leaders and others who speak their mind. Usually those who are disappeared have nothing to do with the FARC." Are you shilling for Hugo Chavez over the death of FARC narco-terrorist Raul Reyes? Warmongering to people like you are only bad if it happens to be implemented by people whom are remotely Capitalist or right-wing. But it's okay if Comrade Hugo and Correa do it. I probably should have said anti-communist rather than free. Colombia has been fighting communist rebels (FARC) for 40 years. Colombia is also a centre for drug traffiking which makes things worse for all sides. I acknowledge that Colombia's armed forces have probably committed atrocities, but I am also very aware how leftist propaganda works and take allegations against the military with a a bucketful of salt. You always here these stories about "innocent" people being tageted by the military-usually they are not so innocent and quite often they are hit by their own side-you'd know this from the Philippines Cameron. Colombia is a pro Western nation with a comparitively sound form of government, while virtually all its neighbours are sliding into socialism and tyranny. While I don't regard Colombia as perfect, I'll take Uribe's government over neo-communist Venezuela, Brazil or Ecuador anyday. have you noticed this flame war between Labour's Trotter and SW's Carolan over the election? Considering the fact that self-confessed socialist Kevin Rudd has in the past expressed admiration for Chavez and his Komrade in New Zealand is just to the right of Stalin, it's no wonder this clown feels so at home in our neck of the woods. I wonder what he's going to be stirring up in the smoky beerhalls of New Zealand. colombia is free like america is pro peace. colombia is free like national is pro worker and labour listens to people. colombia is free like don elder didnt hire spies to spy on environmentalists. aggression should be O.K when it's directed up-wards from the people towards fascist scum like yourself trevor. I hope you're assassinated, problem is in this country: there is no assertive political violence, other than that used by the state and police against innocent citizens trying to make a real positive difference in society (unlike your own parade of neurotic and ridiculous daydreaming about the possibility of revolutionary violence) the brutal terroristic and institutionally violent capitalist state is destroying this country and hurting the people. Well you know you're doing a good job when people feel so threatened they feel the need to say these sort of disfunctional things!